Beavers build dams in rivers and streams, and building their home (known as beaver lodges) in the resulting pond. They also build canals to float build materials that are difficult to haul over land. They use powerful front teeth to cut trees and plants that they use for building and for food. They sometimes seem to cut down trees just for fun. When startled or frightened, a swimming beaver will rapidly dive while forcefully slapping the water with its broad tail. This creates a loud "slap", audible above and below water and serves as a warning to other beavers. Once a beaver has made this danger signal, nearby beavers dive and may not reemerge for some time. Beavers are slow on land, but good swimmers that can stay under water for as long as 15 minutes. A frightened beaver will occassionally attack a human. Beavers do not hybernate, but store sticks and logs underwater to feed on during the winter. Beavers have webbed hind-feet, and a broad, scaly tail. They have poor eyesight, but keen senses of hearing, smell, and touch. Beavers continue to grow throughout their life. Adult specimens weighing over 55 lbs. are not uncommon. Females are as large as or larger than males of the same age. 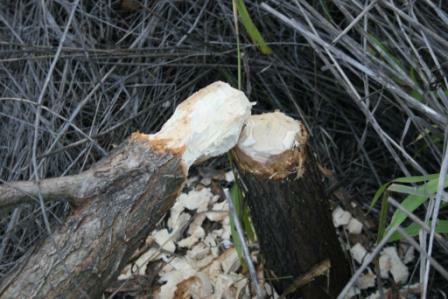 Beavers cut down trees for several reasons. They fell large mature trees, usually in strategic locations, to form the basis of a dam. They fell small trees, especially young second growth trees, for food. Ponds created by beavers also kill some trees by drowning. 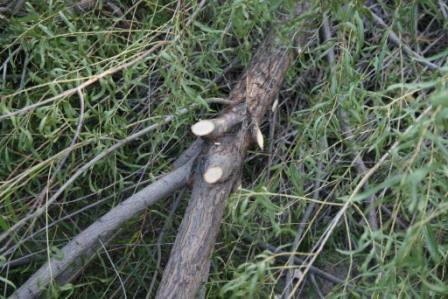 Beaver Damage to a young willow tree. Cuts on small limbs resemble mechanical cuts. 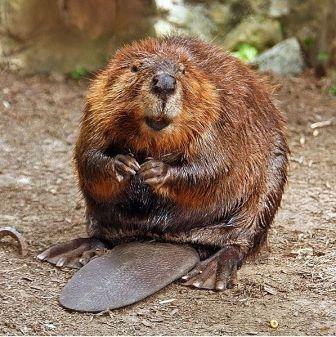 The beaver works as a keystone species in an ecosystem by creating wetlands that are used by many other species. Next to humans, no other extant animal appears to do more to shape its landscape. In general they help to keep water systems healthy and in good repair.